How awesome is this! 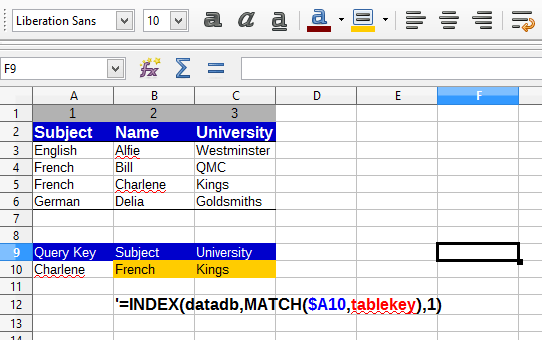 Excel =INDEX, is a matrix retrieve i.e. =INDEX(array, row, col) retrieves an entry from the two dimensional array. If we combine this with MATCH which returns a row number we can use these functions instead of =VLOOKUP, its allegedly faster too. MATCH operates on a column or linguistically a list. will return from the replycolumn, the element corresponding to the querykey. The matching key is 0,1,2 for equality and less than, greater than. This needs example uploads; for another day. I was pointed at this, http://spreadsheeto.com/index-match/ by the author, exceedingly comprehensive. If the source array is a table, the functions will prompt for the columns names.